"A bran muffin made with buttermilk and golden raisins. This is a recipe that is a combination of a variety of trials and errors. 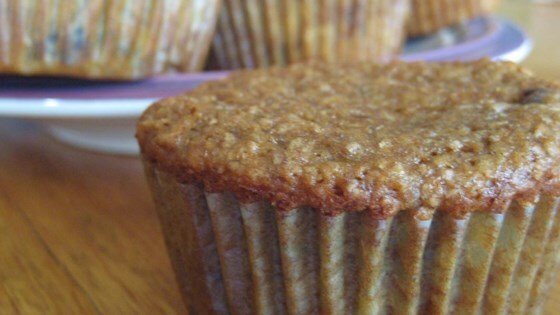 It is the only bran muffin recipe my husband likes." Preheat the oven to 400 degrees F (200 degrees C). Grease a 12 cup muffin tin, or line with paper muffin liners. In a small bowl, mix together the wheat bran and buttermilk. Set aside to soak until thickened, about 10 minutes. In a large bowl, use an electric mixer to blend together the brown sugar, vegetable oil, egg and molasses. Stir in the bran mixture. Combine the flour, baking powder, baking soda and salt; stir into the batter until just moistened. Mix in raisins. Spoon batter into muffin cups, filling 3/4 full. Bake for 15 to 20 minutes in the preheated oven, until the tops spring back when lightly pressed. Well , I always feel pretty lame rating a recipe low when everyone else rates it high.....but, this was bad. This is the best muffin recipe! I'm starting a small muffin and orange juice business and using these muffins. I wish that I was one of my customers. I've tried these muffins. This recipe is awesome! I didn't have buttermilk on hand, but substituted 1tsp of white vinegar in 1 cup milk (let stand for 5 minutes after mixing). Light, fluffy and moist!